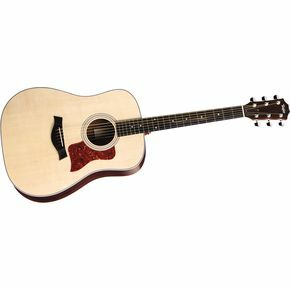 The Taylor 210G Dreadnought is the perfect choice for an up-and-coming musician. With broad shoulders and a deep body, the full-bodied sound of this gorgeous instrument will leave your listeners in awe. It doesn’t matter if you are a fingerstyle player or a flatpicker; the woody, well-rounded resonance of the 201G (a sound that can be attributed to its gloss solid spruce top and Indian rosewood laminate back and sides) will project itself in nearly any situation. Even switching styles in mid-set won’t be a problem, meaning that you will be able to save yourself the annoyance of carting around multiple guitars. In fact, the 201G seems to thrive on mixing it up and proving just what a great all-around guitar it really is. While the depth of the dreadnought’s body and the width of its shoulders may make this model a little more difficult to handle for the younger or more slightly built players, if you can manage the reach, you should by all means consider adding this model to your collection. What can it hurt? It’s only $749, and it comes with its own gig bag and Taylor’s reputation for producing some of the best acoustic guitars available. Who knows, this may just be the guitar that will propel you to fame. NOTE: The Taylor 210 replaces the Taylor 210G, which is no longer in production. The guitar is the same - the 210 comes with a soft/hard case. The 210-G came with a gig bag.